If you'd like to email me, simply click on the link below. Cheeseburger Saturday Night will not be seen tonight, due to the special Saturday Concert Blog already in progress. Here we are at Irving Plaza. Inside I ran into my friend Eric, his brother Scott and there's Brian on the right, the man responsible for getting me in the door. It's starting to fill up. The show is completely sold out tonight. Nice to know there's still a lot of Damned fans out there. I've always loved concert t-shirts and thought I'd take a photo of some of them in the crowd. Here's the Cramps. Electric Frankenstein. Never heard of them, I'll have to check out YouTube later and see if I can find them. Here's a t-shirt from the Iggy and the Stooges reunion tour a few years back. And you can't be at a punk rock show in New York and not run into a Ramones t-shirt. Here's a shot from the upstairs balcony, lots of people here tonight. 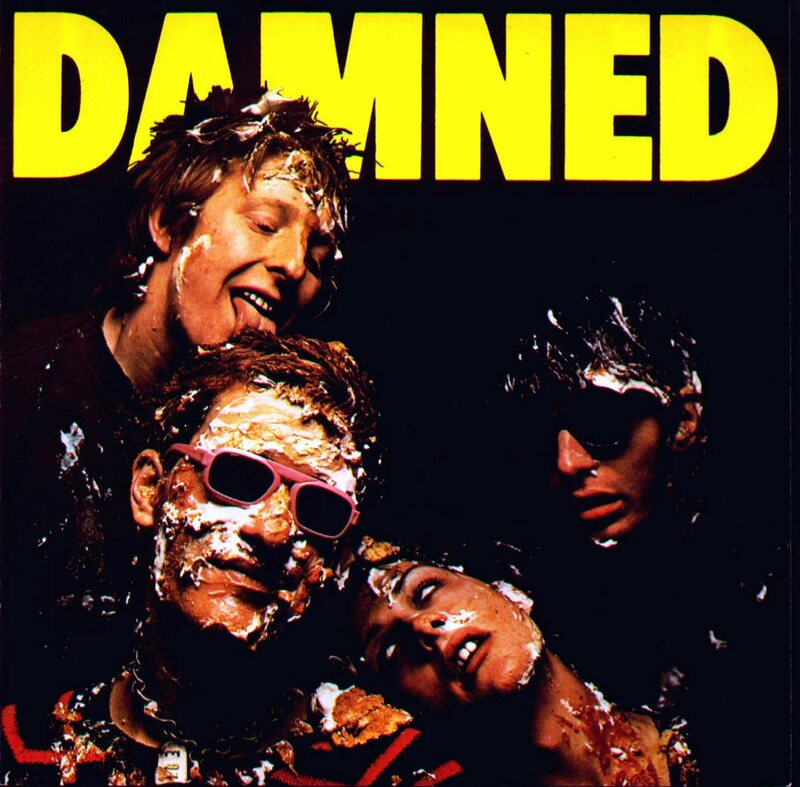 And here they are: The Damned. They kicked the concert off with my favorite Damned song, "Neat, Neat, Neat." I need to get closer to get some better shots of the band. Holy fuckballs, it's packed down here. My claustrophobia is kicking in big time. The closest I got was the back of this guy's head. I retreated to the bar and took some shots from the video screen on the wall. Lead vocalist, Dave Vanian. Captain Sensible looks exactly like he did back in 1976! Monty Oxy Moron on keyboards was a madman! A real showman and bundle of energy. It was a great show! Thanks again to Brian for getting me the ticket! See you tomorrow after dark. Further reading: Wikipedia, All Music and last.fm. I'll be the paint on the sign if you'll be the tin. After my post on Just Bulbs a while back, MAD commenter and author, Jaws the Cabbie sent away for some bulbs. They arrived and he sent in this photo. Very nice, thanks for the update and photos, Jaws! What can you get at Just Bulbs? And here we are, Irving Plaza. Someday I plan on changing my name to Irving Plaza, but not tonight. Okay, let's go get in line. I'm about 45 minutes early, so I'm the fifth person in line. Okay, through the magic of the internet, you're spared a 50 minute wait and we're now in the main lobby and the first thing we see is Marky Ramone's Pasta Sauce. A Chef Boy Ar Dee Dee moment indeed! And the stars of the evening...the bartenders! And a familiar face! John Holmstrom, founding editor of Punk magazine. I interviewed John years ago when he was the publisher of High Times magazine. He told me he's working on a new book about Punk magazine. I'm looking forward to that coming out! And here's John onstage introducing the first band of the evening, The Indecent. This is a band to look out for, they were great! Check out a video of them here. Offstage in the lobby with friends after the Indecent's set was over. And here's the raffle ticket table where Biff told me Debbie would be. Debbie...you're not quite what I pictured! Actually this is Staten Island Tom, who was filling in for an absent Debbie. I bought a raffle ticket anyway. I didn't win. Sob! Bebe and Jim, America's cutest couple! Joey on the video screen in the theater. I had a photo pass and ran into my friend Jason Kuffer in the photo area. A shot of the crowd from the photo area. Next up was Richard Lloyd. He played a blistering set! Danny Fields, the Ramones first manager and man whom the book, Please Kill Me is dedicated to is on the video screen. And now, a series of photos I like to call, "Backs to the Future." Or something. A face in the crowd, drummer extraordinaire , Clem Burke. And here's Clem onstage drumming with Hugh Cornwall, formerly of the Stranglers. And at this point my camera batteries gave out, but there was plenty more show and I had a great time. Thanks to Ida Langsam for getting me my photo pass! Happy Birthday, Joey Ramone! Further reading: Joey Ramone, Mickey Leigh, John Holmstrom and Punk. You might also like: Joey, Tommy, Dee Dee and Johnny. My friend Paul Scanlon sent in this link from Boing Boing. Aaaaaahhhhh! Meanwhile, BBC member and soon to be birthday boy, Gene Rubbico sent in this oblgatory bathroom shot. And finally, Tim "Clacky" Clack, sent in this photo all the way from Australia. He titled it: "Cardboard box man's fundamentalist cousin has had enough!" Copyright © 2012, Marty After Dark; Marty Wombacher. All rights reserved. If you use anything from this website, please give credit and a link.